I think I've mentioned before that when given the choice: Pie or Cake...I'm gonna choose pie 97% of the time. I just love a warm slice of pie (especially a fresh fruit pie...although I can't turn down a slice of pecan) with a cup of coffee. A la mode, usually. And I've always considered cobblers, crisps, crumbles, bumbles and the like in the same category as pies. Whether right or wrong, it's just the way I think of them. If you're not one to make pie crusts...or if you're in a hurry...making a crisp is a fantastic option. You still get that warm, oozing fruit but without the extra time and patience it takes to make a crust. Not that I think making a crust is especially difficult or time consuming, but I know there are those of you who do. Plus, this version uses the sweetness of the fruit and nothing else but a minimal amount of sugar in the crispy topping, so it's kinda like eating health food and not even knowing it. Wouldn't you agree? While I used peaches and strawberries for this crisp, you can use 4 cups of any fruit or berry you like or a combination. 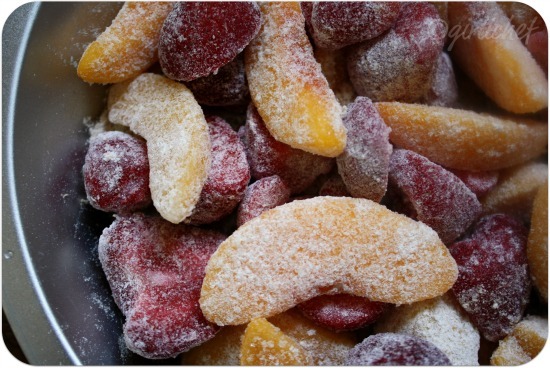 You can also use frozen fruit in place of fresh, if that's what you have...but you may need to tack on another 10-15 minutes of baking time if you do. 4 Tbs. unsalted butter, at room temp. Preheat oven to 350° F. Toss your fruit with the 1 Tbs. of spelt flour in a 9" pie plate. Combine the rest of the ingredients in a bow and mix with your hands until it comes together in pea-sized crumbles. Sprinkle the topping evenly over the fruit and bake for ~45 minutes, or until the top has browned and the fruit juices are bubbling up around the edges. This is awesome served warm with a scoop of cold ice cream. And personally, I don't even mind serving my kids a big plate of this for breakfast. 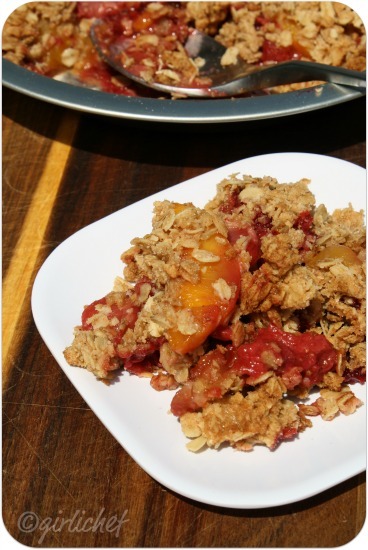 wow I will have to prepare some peach crisp too! Yours look so crumbly and delectable! You know what? I even have all spelt flakes ;-)) Shall make this for my husband. He loves crisp! Crisp! I love crisps! This one sounds interesting with the spelt. I love making recipes healthier when you can't even tell the difference! I too love crips...yours is looking so lovely..with all the goodness of fruits and oats. 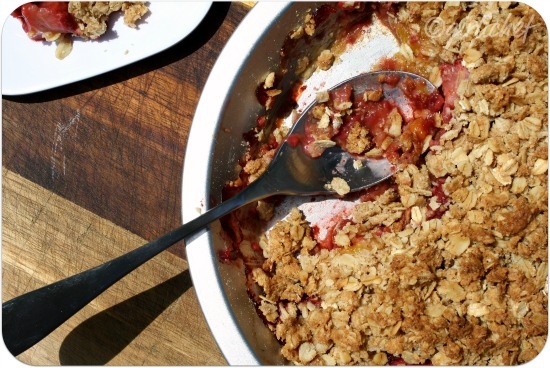 There's nothing like a crisp to bring out the flavors of lovely, fresh, summer fruits! Love Gwynnie! Just got the cookbook and have been trying recipes from it, too. Peaches aren't in season here yet (I'm not sure they'll coincide with strawberries), but I will definitely try some fruit combo. I'm excited to see if I notice a difference with the spelt flour- I've never really worked with it before. And, you're right, ice cream is a must! Scoop of vanilla ice cream on this and that is all I need for the day! Sheer joy! Fruits in desserts always get left behind in our house, but I've made a promise to have a pear galette our this week. We just eat them fresh, but you're right that warm syrupy fruit with ice cream is heaven. This crisp looks so good. Good enough for breakfast too. What a great way to bring peaches and strawberries together! I like that it's practically health food too. vaya receta buena, me gusta mucho. What a healthy breakfast spread, Heather! Wish I could get Spelt and make the same. Could imagine the fruity and nutty taste of the dish. I love stuff like this where all of the flavors are cooked together and marry into one another. Also excuse my ignorance but whats a "Bumble"? I wouldn't mind eating a big plate of this for breakfast either. I'm definitely going to make and devour this one! This grouping of pictures has me drooooooling. Ummm! I'm ready for a big bowl of that now; it looks fantastic! It's perfect for the summer fruit! Love this dessert. I would take yours anyday! I agree with you. Eating fruit with oats and thinking is dessert. You fruit crisp looks really crunchy. Thanks for the idea. I will have to do it today. I'm not a dessert person, but boy, I'm hard-pressed to resist a good crisp. Heaven. I just have to let you know that my crisp is in the oven right now. Plums and strawberries. The only change I did was to place the oat sin the food processor to give them more of a meal texture. On my lazybones days I choose to make crisps because of the ease. Love the rolled oats - and will probably do something similar - with rhubarb - to use up the last of it. But your peaches and strawberries go so prettily together - so many wonderful summer choices! i wouldn't mind serving this to MYSELF for breakfast, delicious! i just love that crisp topping and oozy fruit beneath, irresistible! Fruit? Oatmeal? This definitely is in the breakfast category. 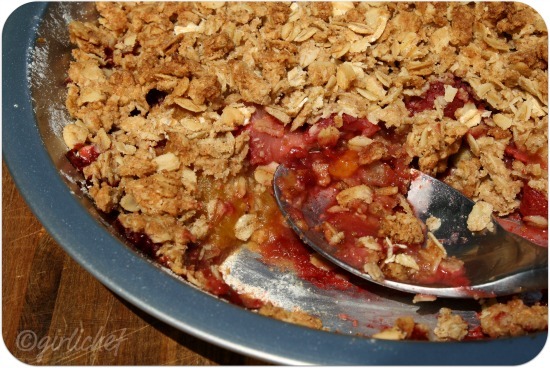 :) I love making crumbles, because then I don't have to make a pie crust. This looks really good! I would definitely find it super hard to decide between cake and pie/crisp....I'll just have a piece of both! I love that crisp topping...and the filling of course. But I think we can all agree that the filling is just a vehicle to eat the topping. I keep hearing great things about Gwyneth's book. Perhaps I'll have to give it a shot! This looks wonderful. By the way, I'm with you. I love fruit anything, especially pie. I really like fruity cakes and trifles though. The fruitier the better! Never noticed these two fruits paired together before, but gosh this sounds so good! Thank you for sharing with Cookbook Sunday. Mm. That looks delicious! I have to cook when I babysit sometimes, and I think that's one some of my kids would love! bookmarking now - can't wait to try! Heather you don't know how much I would love to serve that for breakfast! I'm thinking get up early and cook with the dutch ovens over a pot of coffee. I certainly wouldn't mind if you served me a big plate of this for breaky, but I am envisioning it as a late night snack - the kind you sneak into the kitchen in the middle of the night for, and eat it right from the cooking vessel with a spoon.